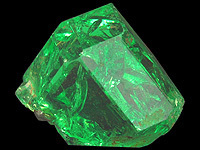 Tsavorite garnet was first discovered in Tsavo national park near the border between Kenya and Tanzania. A member of the garnet group, the species is grossularite and the variety is tsavorite. 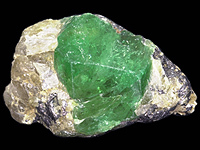 The attractive green color of Tsavorite is caused by the presence of chromium and vanadium. 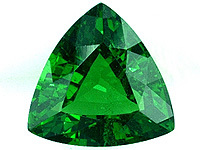 Tsavorite is a trade name often associated with darker green garnets but there is no universally accepted standard that designates which shade of green qualifies as tsavorite. Our gemologists consider the presence of chromium to be the proof and they refer to green chromium bearing grossularites as Tsavorites. Tsavorite(s) are organized in the following categories: Calibrated, Closeout, Pair, Single, gemstones. Our most expensive Tsavorite is USD 17037.00 and largest Tsavorite weight is CTS 23.46. Our cheapest Tsavorite is USD 1.35 and smallest Tsavorite weight is CTS 0.00. Our Tsavorite(s) are available in various shapes, sizes and colors. 535 Tsavorite(s), too many to look through? You may select any combination of search options. Colors grade into each other and you can search for more than one color at once. For a better selection, try selecting two or three colors, -- your first choice plus the two closest colors. Tsavorites are relatively hard so they polish well. Like all garnets, they are singly refractive and as a result can be especially brilliant. Suitable in any kind of jewelry tsavorites offer excellent value and utility at a price more affordable than emeralds, especially in smaller sizes. Clean stones over 10cts. in size are extremely rare and much more expensive. Much of the recent productions has centered around Voi, Kenya but some tsavorite has also been found near Arusha, Tanzania in the block D tanzanite deposit near Meralani as well as occasional stones in the Tunduru gem gravels in southern Tanzania. It is interesting to note that since the darker material is from Kenya and the lighter colors are from Tanzania, the Kenyans insist that only the darker stones should be called tsavorites.